This past weekend, notable, highly respectable [and former] Automattician Philip Arthur Moore wrote a fantastic article that’s been making it’s way through the usual suspects and circles entitled We’re Ruining WordPress (This Needs To Stop). But in the hopes that some of those of you who read this blog are fellow bloggers, publishers, readers, designers, developers, and so on, I wanted to link it here with you to make sure you didn’t miss it and because I hope it resonates with you. In short: If you’ve yet to read it, I highly recommend it – it short, poignant, and will likely strike a chord with many of you who are looking to contribute to the WordPress economy, have a business within the WordPress economy, or who enjoy following the WordPress economy. Many of the things that Philip outlines in his post is what we’ve seen happen in other economies, too: Just look at Google Play or the App Store and how little apps cost. Games that used to run us $30 – $50 on a given system now cost $4.99 to $9.99 and people still complain (and it’s not even worth talking about in-app purchases). Anyway, as much as I enjoy writing about WordPress and the various facets that come with it, and as much as I enjoy doing so with the occasional meme and what not, this particular post hit home with me because I’ve been working in the WordPress economy for several years at this point, I’m getting ready to push forward with a new effort, and because I’ve been thinking about this for the last few months (and clearly more so over the last few days), I thought I’d write a WordPress theme developer introspective of sorts on how it feels to be a part of the WordPress theme developer economy, its challenges, what I want to see change, and what I plan to begin doing as soon as possible. For the last few years, I’ve been involved with working in WordPress regarding blogging, plugins, speaking, and themes. Though it’d be fun to talk about all of these – and to hear your comments on all of them, as well – this is strictly about WordPress themes. A quick screenshot of a timely update related to this post. Specifically, these are my thoughts as it relates to working in the WordPress theme industry then, now, and how I plan to move forward given some of my takeaways from this article (and a few others I’ve read, too). There’s very little to say about this that hasn’t been said, but to say that we’re facing a gold rush that’s leading us to the bottom of the barrel is an understatement, and I’m comfortable saying that not only because of observation, but because of experience. 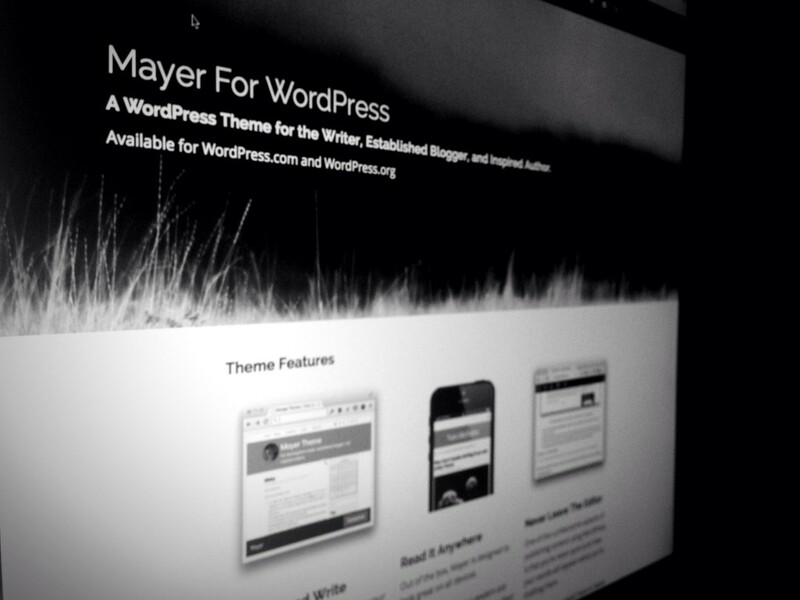 I’ve had the pleasure of working on Standard (prior to its acquisition) both for WordPress.com and for WordPress.org, working on the next iteration of Live Theme, and have I’ve been selling Mayer in WordPress.com for approximately one quarter. The common denominator among all of these themes (among others that I’ve yet to mention) is that the pricing was too low for not just the amount of work that went into the products, but for what the themes actually provided – or the solutions they provided – for end users. The problem is that we’ve conditioned our customers to expect powerful features, amazing designs, and truly high-end experiences for far less than said things are worth. Of course, everyone knows that there are two sides to every story; however, I’m not at all interested in talking about what theme marketplaces are doing what, how they’re doing it, who we should look to for a positive model, and who shouldn’t be. Instead, try to sift through all of that ether, fog, and noise and think about and focus on some of the most attractive, best functioning themes that you’ve used – and yes, this will be different for each of us – and the odds are that the work that has gone into making it effortless to achieve a seemingly simple task is likely the product of skilled programming. This means that a team (or perhaps even a single person) has sat down, worked worked their way through the problem on notebook paper, devised a solution – or likely a set of solutions – to the problem, painstakingly implemented them, all so that the customer and toggle a checkbox so that pages are programmatically created, populated, given a template, and so on. Not only does this go back to the first point, but leads into the second point, as well. I know – when it comes to compiled languages, interpreted languages, and all that jazz, there are semantics that come into play as to what some programmers consider software. For example, some developers think software is anything that is compiled to binary code. Some people think that HTML can be considered software. Regardless of where you fall in the stack, one common thing that software – however you may define it – has is a lot of moving parts that work ideally in harmony to produce something from the sum of its parts. Ultimately, they all work together in order to produce the product that you use in order to publish your words, power your site, or run your web application. To that end, there is engineering that’s going into these products. The problem is that many themes aren’t being approached as such. Instead, I believe that they are viewed as a means to and end of making money and the quicker that a person or team can churn, burn, and price a theme, the faster they can make a quick buck. There are people who are doing the exact opposite and it shows in the quality of their work, their testimonials, and their pricing. But just as the market allows cheap knock offs to be created and sold alongside high-end products, such is the nature of the theme industry. That doesn’t mean we have to keep going in that direction, though. When enough companies decide to rethink their strategy, re-evaluate their problem space, and solve problems in creative, well-engineered ways, we can begin driving the prices back to where they need to be – competition can do that. But when I look at the maturity that WordPress has achieved over the last few release cycles (automatic updates, for example), and what’s coming in future updates, it’s a bit embarrassing what we’re creating on top of it and then selling it. We’re not showcasing the foundations abilities, and – to some degree – we’re disrespecting the core application and the contributions that have gone into continue making this the platform for powering so much of the web. The thing is, it’s not just about prices. It’s about people. For some, blogging is a casual hobby, for others, it’s an incredibly personal form of self-expression, at least on some level. To that degree, we – as themers – should take extreme pride in the work that we do as we’re representing the way that others are opting to publish their words to the world. Perhaps you don’t see it that way, which is fine, but the truth of the matter is that some people spend an extraordinary amount of time working on their blog – tweaking it, styling it, and then drafting the posts that they’re doing to eventually publish perhaps only for others to critique. Not only should we take pride, but we should take great care of those people, as well. In previous posts, I’ve talked about the nature of complaining about your customers and the irony of doing so when, without them, you have no business. I know – some customers can (and sometimes are) a pain to deal with – but just because someone doesn’t know as much as you who created the product doesn’t make them a less intelligent, less capable person. We need to treat them with the utmost patience, respect, and gratitude as dictated for out of all of the hundreds of thousands of both free and premium themes available, they opted to use ours. So slow down – stop making this a volume game. How many of your favorite companies are known for having an extremely high volume of products from which to choose? For example, look at some of your favorite bands and how many years – or decades – it took just to create, say, five albums. I know, there are counter examples to this, but do you really want to be grouped in with them? Instead, focus on pride, care, and quality. Yes, it will take more time and you’ll be turning out more products, but what’s the actual point of what you’re trying to do with your company if not that? And I feel guilty about this, too: There are side projects that are related to WordPress that I’ve been working on (with others, no less) that’s taking me far longer to complete than some may argue is necessary because it’s a FOSS project. I will not apologize for taking my time building something for free to give back to the community when I have paying customers who are working with a theme for which they’ve paid. Themers – myself included – are weak at marketing. In fact, I’d say that it may be the thing we’re worst at (of course, some of you may argue), but one of the things that I’ve seen touted over and over and over again from nearly every single theme developer and/or theme company is that they have high-quality code. It’s used as a point of marketing, but get real: This is not a point of marketing. The average user doesn’t know or care what constitutes high-quality code or why it matters. This should be a given. We should not have to advertise this. On top of that, how are they even able to evaluate that? It’s impressive to me that the average blogger purchases the ability to customize their theme through the use of CSS and learn a little bit of that in order to tweak their blog to their liking. But who’s to know – or care – how, say, transients are used in order to squeeze slightly better performance out of a theme in certain places? Quality code is not a point of marketing. This is an assumption that customers have when they buy a theme – they assume that it has a high degree of quality. No one sets out to purchase a theme that’s cobbled together. But we do customers a disservice by claiming that that’s what’s included whether or not it’s even true, it’s disrespectful to take advantage of people in that way, and we need to stop claiming that. Finally, WordPressers love to talk about the whole “decisions, not options” mantra that WordPress espouses, but if you look at the work that we churn out, you wouldn’t be able to deduce that. Instead, it looks like we care more about giving users such a high number of options that the complexity of the decision-making takes them to a point of frustration such that they don’t even know what looks good any more. But I kinda love hearing that. When I set out to create that theme, I did so with the intent that the user would be able to install and begin writing as soon as possible with as few proverbial knobs to turn as possible. I made decisions on behalf of the customer in order to help their blogging experience, gave them just enough options to personalize the theme, and then shipped. If the customer didn’t like it, then that’s okay. They were not the ones for whom I was building the theme. The truth is: I’ve lost a few sales because of it and it’s because people are used to having every, say, font available to use when they don’t even know a thing about typography (I don’t, but I’m willing to research it for things that I’m working on and I’m willing to seek advice from those who know better about the area than I know). Why should we arm them with the ability for them to do something that may damage the look and feel of their site? As the Theme Customizer is gaining popularity, we’re already seeing it being abused to do exactly this. But that’s a topic for another post. Instead, if you’re absolutely serious about making decisions on behalf of your users rather than giving them an array of options and calling each of them features, then do so. Stop giving lip service to the philosophy. Speaking of a lip service, it’s much easier to give exactly that when, in reality, perhaps we need to have a little less conversation and start actually making the changes that we seem so passionate about pushing through. We need to do a better job with the documentation of our themes. This includes code documentation, user manuals, and perhaps even videos that walk users through how to use certain features. Though it’s funny to joke that “no one reads a manual anyway,” I’m sure it would go a long way to actually provide users with how to use the product they’ve just purchased. Avoid bringing the general public into the debates about the GPL. This is not to say that conversation around licensing isn’t important – because it is – but that the average customer doesn’t need to be brought into these conversation unless s/her voluntarily wants to enter it. Perhaps include a page about it on your site, but don’t go on a long rant about it among all of the marketing and purchasing jargon. We need to make the purchase process as easy, painless, and pleasant as possible. On top of that, we need to make sure that account management is easy, too. If there’s an update for a theme, it should be easy to login and grab it – there should be as few hoops to jump through as it relates to getting the latest and greatest updates to the software they’ve purchased. We need to make sure that we’re staying in touch with our users via newsletters and blog posts in order to make sure that they know the company behind the product is still alive and working on the theme. Let users demo the theme prior to purchasing it – this will let them know what they are in for and it will give them a heads up as to what they can expect before purchasing a product. It will allow them the ability to test drive the theme, get a feel for it, ask any questions that they need to do so upfront and ultimately minimize buyer’s remorse. Yes – there’s more than can be done, but these are some of the larger items that I think are easily actionable (well, okay, some more than others), but that I’m planning to begin implementing as soon as possible. If we want WordPress to continue to be taken seriously, and we want our themes to help provide a sustainable business, we need to change the current model; otherwise, we’re going to continue racing to the bottom and then we’re going to be left with nothing more to complain about than what we did to ourselves and the economy we created. More than a year ago when I launched my theme shop (not gonna drop links), I decided to do the unthinkable – charge $199 per theme, with 1 year of updates/support. Sure, drawing a conclusion from a single person can be considered a hasty generalization, but when we’ve got Automatticians (both past and present), other people who are more familiar with the business side of things, and our own levels of intuition telling us something that’s wrong, then we need to change what we’re doing. Right now, we’ve nowhere to go but up, and I really, really want to be someone who contributes that. The alternative is simply no longer an option. Just FYI, Moore’s article is titled Why We’re Ruining WP, not “Running.” Big diff. Oh, it’s not that big. Come on :). Fixed. Thanks. Reading italics never was my talent. Tom, a good read just like Moore’s article. I’d like to add that this also holds true for plugin developers. Plugins are more and more front facing today and it’s very important that they are error free, well documented and works as much out of the box as possible. Absolutely. I considered tackling this as well, but given the nature of the topic and the length, I thought it best just to leave it for someone else to cover ;). The fact that some of us have to do things like what Brad talks about to filter through some of the errors that are being dumped into the logs (a la – http://bradt.ca/blog/ignoring-errors-wordpress-debug-mode/) is terrible. There should be great pride taken when pushing out a theme or plugin, or anything for that matter that you put into the market to sell. I’ve run into instances that use that “high quality code” marketing tactic and seen it output errors on every page load. I, too, say that it’s up to us to change the tide for the better. Being that 20+% of the web is run with WordPress, that’s a good portion of our “neighborhood”. Let’s make our neighborhood the best place it can be. There should be great pride taken when pushing out a theme or plugin, or anything for that matter that you put into the market to sell. I’ve run into instances that use that “high quality code” marketing tactic and seen it output errors on every page load. Exactly. So let’s start pricing things at what they are worth. I’m planning to begin doing so very, very soon :). I recently joined a software Solutions company. I was charged with creating a business Model (chose Freemium) , a sales strategy, and marketing plan for our product. Being new to the WordPress Plugin world it was difficult for me because I never had to deal with three variables that I think might be unique (at least in my experience) to WordPress. First, we had to give our product away, second we had to price against dozens of free competitors, and lastly there was a this huge sense of responsibility to a group of people in this community called “WordPress”. I understand now why, and really enjoy the community atmosphere, and am better for it. However, it was really different at first. How much do you charge your friends for doing their websites? My colleagues’ ( people who actually create our products) have been a part of this community since it started and sensitive about WordPress. Making money and serving a community is a challenging task, in my opinion. It was tough setting a price for our product. We opted to go back and Drastically improve our plugin(15 more months of changes and upgrades…not real popular decision with the guys financing us) so we could charge a decent rate and monetize it, aiming our plugin at fulltime WordPress developers. I don’t think we can build a product then throw it out there and see what we can get for it. We have to engineer something that takes care of an identified need, and do it in such a fashion that we are proud of the price……even if it’s 4 times higher than our competitors. It’s going to be interesting watch WP grow. I am learning a TON every week. I would love to hear everyone’s perspective on the recent funding WordPress received and what people think it should be used for. I apologize if this has already ben discussed, still working my way around this whole blogging thing. How much do you charge your friends for doing their websites? I could answer this in a longer form, but usually, I don’t do my friends sites (though I think your question what rhetorical in nature ;). My colleagues’ ( people who actually create our products) have been a part of this community since it started and sensitive about WordPress. Sensitive how? Curious to hear :). Making money and serving a community is a challenging task, in my opinion. To a degree, but it’s still a business. It’s a different type than what some are used to, but it’s still business and one should never be afraid to charge for their product regardless of the nature of the licensing. I don’t think making money and serving a community is mutually exclusive. Even more so, perhaps the largest oddity about the WordPress community is how many of us are friends despite the fact that we’re in the competing space. and do it in such a fashion that we are proud of the price……even if it’s 4 times higher than our competitors. I would love to hear everyone’s perspective on the recent funding WordPress received and what people think it should be used for. I apologize if this has already ben discussed, still working my way around this whole blogging thing. These types of discussions are usually going to be discussed more on sites like Post Status so browse the archives over there. I think you’ll really love some of the content they have. Great article, and some points that I think go beyond just the world of WordPress theming. I’d clarify this to also include making it available let to play around with in the Admin. Often its hard for customers to reproduce what they’ve seen in the demo site upon their own websites. I agree with this completely (and should’ve stated it in the article). In fact, sometimes I think doing this can go far beyond even having a manual because the users can “touch and feel” the actual product rather than just reading some promotional material or how to guide. Thanks for this comment – such a good point. Excellent article. We are actually making our life and also user life more complicated now a days. Although I think this is true — and important. If you’re going to go down this route, it cuts two ways. One is pricing, another is ongoing support and features. A higher price I think we can all try to push for, but unfortunately I think the cheap coding costs in many parts of thr world and venues such as Theme Forrest will prevent all but the best places from being able to do that. The same thing happened in the mobile App Store, except it was developers themselves that raced to the bottom. Interestingly, desktop software (at least on the indie Mac side) has become less expensive, but has held up better over the last 5 years than iOS apps or WordPress themes. That said, the developers that lead should charge a fair price for their product. Period. Here’s my issue with that: I see a a ton of shops moving to a support/update model that is capped at one year. That isn’t a real solution, I don’t think long term, if you’re treating this like software. Yes, the trend for big software ships such as Microsoft and Adobe might be moving to the subscription service model, but that model comes with an implicit agreement that thr software will not just be maintained – but improved with new feature – year after year. It’s also true that MOST consumer software (which us the proper corollary for a WordPress theme, not enterprise stuff), is still sold at a perpetual license. My issue with one year support/update stuff is that I’ve been burned by plenty of theme shops or plugin places that don’t bother to update or do decent support during said year. So if I’m going to pay a subscription for something, make it worth my while. Instead, I have a different suggestion: charge for upgrades and cut off support after a certain date. So if you don’t updare the a theme more than twice in a year, a user doesn’t have to pay to subscribe to updates the next year out of dear. But, if you want to roll a huge new updare our in 18 months or 13 months, do if and charge for the upgrade. Keep supporting old versions for a reasonable time frame and then shut it down unless people pay. My point is, if themes are going to be seen as software, developers and buyers need to understand that relationship. Don’t think that just because Adobe can get me to pay $50 a month for Master Collection that your theme or plugin is worth the same for a single user. It’s not. Likewise, customers need to understand that if they buy version 1.0 of a theme, there is no guarantee 2.0 or 3.0 will be free. Christina – this is a fantastic comment. Thanks for taking the time to write it (and hopefully I can be just as thorough in my response :). Agreed, which is something that I think developers and/or shops miss. I agree. I’m not economist, and I don’t claim to know that much about business, but I’ve been self-employed and around long enough to pay attention to what other marketplaces are doing in both WordPress, OS X, iOS, Google Play, and so on, and so on (they go on for so long, right? :) and it’s interesting to see how the race to the bottom has happened in iOS, but more slowly in OS X.
I do think game producers – for one reason are another – seems to be changing their pricing based on some of the things that I’ve been seeing in in the App Store, but that’s beside the point. Ultimately, this gold rush to the bottom of sorts is frustrating to watch for those of us who are involved in software in some capacity – be it developers, power users, and so on – because we know the ROI is low, and it’s unsustainable. Something’s gotta give. At least, that’s how I see it. Funny timing that you mention this because I’ve just launched a shop that’s doing the one year recurring model; however, I’m willing to admit that this is something that I’m doing in order to begin shifting away from the transactional model that we traditionally see, and to begin introducing something different. Will it work? I don’t know – I personally think a lot of it is personality-driven. You hit on this later in your comment, so I’ll address it them. Yes, the trend for big software ships such as Microsoft and Adobe might be moving to the subscription service model, but that model comes with an implicit agreement that the software will not just be maintained – but improved with new feature – year after year. It’s also true that MOST consumer software (which us the proper corollary for a WordPress theme, not enterprise stuff), is still sold at a perpetual license. The analogy to Microsoft, Adobe, and more is spot on. You’re right and I agree; however – and I could be interpreting this wrong, if so blame the lack of tone of voice on the web ;) – there’s no easy reason why WordPress themes can’t operate that way. I have a big issue with how things have historically been treated in WordPress because I’d go as far as to say that it’s the lowest of the low when it comes to pricing, support, upgrades, and so on. I absolutely agree with you. I hate that part of the WordPress economy is like this, and I seriously want to do everything I can to bring this to the forefront of a conversation with others involved in WordPress and to make this stop. I don’t think one person can do it, though. It’s an on going conversation and it’ll take a lot of players, but I’m optimistic. The other thing is that I think it’s personality-driven: Some people get into the WordPress, themeing, etc., for the totally wrong reasons and the customer ends up getting shafted giving the rest of us a bad name. I – along with some of my other developer friends – don’t want to shaft our customers. Want to build sustainable businesses, cater to our customers, and do good work. It’s just a shame that things that are in the state that they’re in right now. Instead, I have a different suggestion: charge for upgrades and cut off support after a certain date. So if you don’t update the a theme more than twice in a year, a user doesn’t have to pay to subscribe to updates the next year out of dear. But, if you want to roll a huge new update our in 18 months or 13 months, do if and charge for the upgrade. Keep supporting old versions for a reasonable time frame and then shut it down unless people pay. This is a good idea. I’m not adverse to trying it out either, but I think there are some other models that’ll work if you, say, develop plugins specifically for themes and charge according to those, or something like that. Just another option, that’s all. My point is, if themes are going to be seen as software, developers and buyers need to understand that relationship. Don’t think that just because Adobe can get me to pay $50 a month for Master Collection that your theme or plugin is worth the same for a single user. It’s not. Likewise, customers need to understand that if they buy version 1.0 of a theme, there is no guarantee 2.0 or 3.0 will be free. There’s no guarantee of that, but that can also be said about any software. Even though I despise that argument (that is, the one I just said :), I think that it’t completely possible for a shop to earn to trust of their customers by providing roadmaps, consistent updates via the blog, progress reports (of such), and updates to match. That gets into the issue of brand loyalty which is something that’s probably better for another post. Anyway, thanks for such a great comment. Really good food for thought. Agree. It’s sometimes hard to find this information on the website. It’s usually in the ToS page or their FAQ. Just a simple line that says the products are 100% GPL or Compatible is all that’s needed. What you are seeing is a commoditization of the WordPress economy. As a system admin for 10+ years, I saw this with shared hosting, VPS and now dedicated and cloud services. Users don’t care about code — nor will they — unless theme authors demonstrate why they should. If you look at theme marketing, providing multiple, easily changeable colors accompanies many popular themes. – I am fast and here’s my benchmarks. – I am secure and here’s my security audit results. – I am very usable — here’s my usability studies. Plenty of themes claim they are fast and secure or usable — but few have any data to back it up. Without a Brand (Automattic, Geneisis, Thesis), a theme author is going to have a hell of a time differentiating their theme from any other — no matter how good the design, code or effort. If you are going to buy a generic brand, does the generic manufacturer really matter? Probably not. You are simply buying on price and convenience.